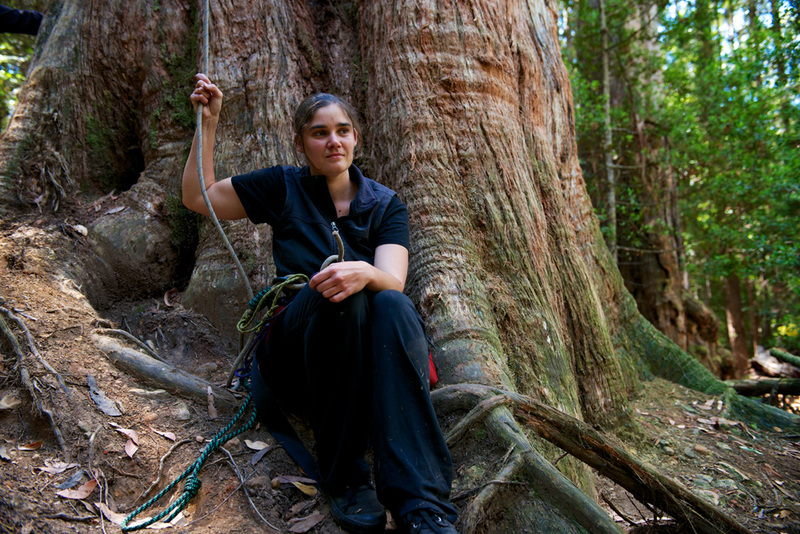 ← You can help Miranda continue her work to protect Tasmania’s forests! It’s hard to know what to say that could possibly capture all that I have been through in these past few days. Firstly I want to say thank you so much to everyone for your ongoing support. It has been so incredible to receive so much amazing support over the 14 months I was in the tree and that has continued over these past days, helping me to get through this time. We all know that the fight is not over. And regardless of whether I am in the tree or on the ground, my determination to protect these forests has never wavered. When I climbed to the top of that magnificent old growth tree in December 2011 I vowed to remain there until the forest is protected. I may have been forced to evacuate due to bushfire, but I am still there in spirit, and will be until these precious forests are protected. Just as I know you all have been there in spirit through out this past year and will continue to be. The job is not done and we will continue to fight until Tasmania’s breath-taking, unique forests are safe from destruction. I am proud of what I have achieved in my time in the tree. For one thing, that forest would have been a clear fell last summer had I not climbed into the upper canopy. Now it is on it’s way to a potential World Heritage listing this June. And beyond the valley and hills that I watched over, there are so many forests right across this remarkable island that I may not have been able to see from my tree top perch, but which I never forgot. Through my action I have been able to expose to the world both the beauty of these forests and the urgent need to protect them from an insatiably destructive timber industry that is tearing the heart out of Tasmania. And the world has responded to the call. All across the globe people have taken a stand. It doesn’t mean climbing 60 meters above the ground – there are so many ways to support this campaign, adding your voice to the call for forest protection. Together we have already achieved remarkable things, including a World Heritage nomination for many of Tasmania’s most iconic forests. I want to share with you all of the thoughts, experiences and emotions that I have been through over these days. From the moment I first saw smoke rising up through the valley, and then watching the fire spread as flames roared from tree tops and my eyes watered from smoke. From the last goodbye in the upper canopy to the moment my feet touched the ground for the first time in over a year. Then all that has followed, in the process of adjusting back to life on the ground. There are so many stories to tell and their time will come soon. Right now I am resting and recovering (as well as doing lots of media interviews!). Stay tuned to the blog, though, as those stories will be making their way to you very soon. For now, the most important thing is to remember how critical it is to keep on fighting at this time. Right now the chainsaws are still carving their way through forests that have been nominated as World Heritage by the Australian Government. The forests of Butlers Gorge, one of Tasmania’s most significant tracts of tall eucalypt forests, are being torn apart by three separate logging operations. This industrial scale logging is destroying the homes of Tasmanian devils and spot tail quolls that were seen on amazing video taken by our remote sensor fauna cameras in the area. You can check out the footage HERE. Please watch and share this short video about recent action by Still Wild Still Threatened to defend Butlers Gorge. Sign the online petition and hold Minister Burke and Prime Minister Julia Gillard accountable for the destruction they are allowing in the forests they themselves have nominated for World Heritage. Posted on March 11, 2013, in Daily Blog. Bookmark the permalink. 5 Comments. I’m sure all the people who have supported you and followed your stay in The Observer Tree, will fight on for the forests and help any way they can, be it with donations, letters, or continuing to spread the word, through Facebook, email, or talking with friends about what is happening. It’s a shame that everyone can’t actually walk through those beautiful forests, it gives such a different perspective to only seeing magnificent photo’s, because you can’t experience the scent of the forest or look up at the canopy, feel the foliage, or just stand and listen to the sounds of the native life within them. I write with huge admiration for you and all the people who helped keep you up there. Madeleine Kennedy. Mt Evelyn Vic. Thank you for your commitment to our beautiful environment. Your actions have made us stop and think about what is happening deep within the forest. It is happening out of sight and mind but when you climbed the tree and wrote so beautifully and passionately you gave us all a birds eye view of the beauty we are risking. You represent what it takes to motivate a change in the thinking that allows this type of destruction to happen. Thank you so very, very much for the time you have given us. There is a beautiful, enchanting little book by the italian writer Italo Calvino, “The Baron in the Tree”, the story of a boy who decides to go and live on a tree out of protest. Everibody shoule read it ! Hi Miranda, I am nearly 50!!! I grew up in Tarraleah, a hydro village. I still have strong memories of my monthly car ride on the semi dirt road to the big city of Hobart to do monthly shopping with my family. We moved to Hobart when I was 6. My then boyfriend is still a farmer who now collects seed to regenerate forests to supplement his income as a farmer……..and maybe also to redeem his fathers destructive work practices!!! And the forests of my childhood have been turned into dead looking pine forests under Forestry Tasmania management. I now travel the world, seeing the mega growth in plastic consumption in every country I visit, the increasing wealth of a world that has no corresponding growth in sustainability. I lament ………. bottled water!!!!!!. I see my nephew capture the beauty and spirit of Tasmania in his photos as a tour guide of the island. I want to impress upon him how beautiful the island was 30 years ago, and how important it is to preserve the place……. as it is…..right now…..without any more encroachment of “sustainable development”, of sustainable growth, of compromise. I have finally learnt the true meaning of “sustain” after 50 years!!! It IS compatible with the word “change”. When i was at university a healthy economic “growth” was 3%. Which really wasnt growth of happiness, but growth of economy. I am raving. i suppose i want to thank you for being the next generation of “hang on! Lets appreciate and recognize what we have NOW! I want to put in perspective and help inspire YOU to continue the work you are doing. It is thankless, but sooo important on a global scale…..please don’t underestimate the importance of the your humble activities, of the impact you are making. I feel flat now, but when I see young people like you do the magnificent, the impossible, it rejuvenates me and inspires me to continue. To make that extra effort as you have done. You do inspire me to reach beyond and dream “la plastique” or what ever!!! Thank you. Maureen thank you for sharing part of your story, I felt so saddened when you talked about returning to the forest of your childhood to find it was no longer recognisiable….. Your post was very inspiring.